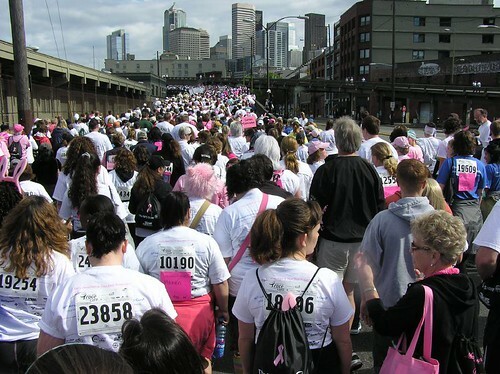 This Saturday is the Susan G. Komen Race for the Cure at Qwest Field. If you’re looking for something to do early Saturday morning, please consider coming out and supporting the Race for the Cure. If you’re not into running/walking the 5K, you can always volunteer or Sleep In For The Cure (you can pay the fee and receive a shirt, but not have to show up to the race). 75 percent of the money raised from this race stays in Puget Sound to help women in our area. The rest goes to support national breast health programs and research to find a cure. If everyone participating in the race raises $150 (the cost of a mammogram), more than $2 million will be collected. I will be there running in memory of Gretchen Mathers an amazing woman I had the great pleasure of knowing and working with who passed away last August from her battle with breast cancer. Also, I’ll be running in honor of a number of my relatives who have survived their battles. Photograph from the 2007 Race For the Cure courtesy of dierken.